Joshua Brown, the first U.S. fatality in a wreck involving a car in self-driving mode, had an adventurous streak with a "need for speed" but also was a brilliant innovator and beloved neighbor, say those who knew the Navy veteran. 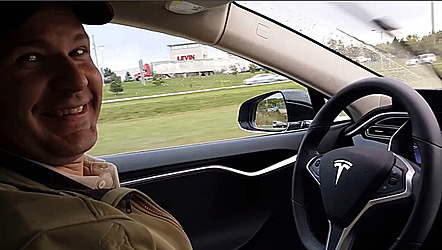 Brown was "like a little kid" when he brought home his Tesla Model S sedan late last summer and always willing to take anyone for a ride, said Richard Tichenor, a neighbor. The 40-year-old single man lived in Canton where he ran a wireless technology company. He bought his modest home four years ago for $40,000 — a little more than half the sticker price of a new Tesla Model S.
Brown died May 7 in Williston, Florida, when his car's cameras didn't make a distinction between the white side of a turning tractor-trailer and the brightly lit sky while failing to automatically activate its brakes, according to statements by the government and the automaker. Terri Lyn Reed, a friend and insurance agent in northeastern Ohio who insured Brown's business, said he loved motorcycles and fast cars. "He had the need for speed," she said. "Kind of a daredevil, loved the excitement." Brown nicknamed the car "Tessy" and praised its "Autopilot" system. He posted videos online touting its capabilities, saying in April it avoided a crash when a truck swerved into his lane. "Hands down the best car I have ever owned," Brown said. Stan Staneski III worked two years for Brown putting in wireless networks. His boss and friend liked to go fast, but "was always a very safe driver," said Staneski, of Denver, Pennsylvania. "I mean, I never once felt scared or threatened while riding with him," he said. "He wasn't in it for the money," Reed said. "He wanted to make things better for people." Sometimes he would travel on business in a motor home, and he loved the outdoors and camping. He'd share stories about his adventures and jumping out of airplanes in the military. Neighbors recalled how Brown would wake up early during winter storms and clean their street and driveways before city snowplows arrived. Friends said he never met a stranger. Next-door neighbor Krista Kitchen said Brown once took her and a friend for a ride in the car and then surprised her friend by turning over the wheel to him. "He was just flabbergasted, but that's just Josh," she said. Reed said she didn't know her friend had been driving a Tesla until she heard about the crash. But, she said, "It doesn't surprise me he was utilizing technology at its best."